Before you begin painting your bathroom, it’s important to know the ins and outs. In this article, you will find all you need to know about what type of paint is best for a bathroom, including the best paint for bathroom ceilings, walls, cabinets, vanity units, and even tiles. Before we look at some reviews of the best bathroom paint for various surfaces, let’s consider some important factors involved in choosing the right paint and how to apply it. Which Parts Of My Bathroom Should I Consider Painting? Which Type Of Paint Is Best For Bathrooms? 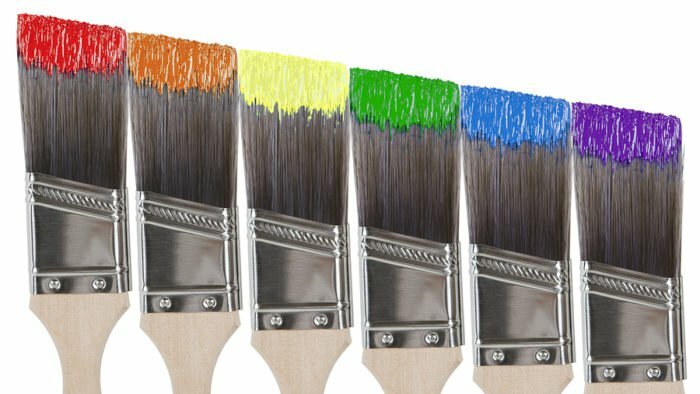 Here are some things you need to know before choosing your paint and picking up a brush, roller or sprayer. Whether you are renovating or just recoloring, you can paint almost any surface in your bathroom. Which paint you should use depends on the surface, but whether you choose oil-based or water-based paint, it should be semi-glossy or glossy. For the ceiling and walls, it is best to use a mildew-inhibiting bathroom paint. For the vanity, cabinets, or other furniture, you can use a variety of paints that are resistant to moisture. You may want to use a water-based paint as these are faster-drying and will allow you to complete the project faster and avoid damaging the paint. Tiles and tubs are slightly more demanding in terms of effectively adhesive paint. There are many specialized oil-based tile paints which you can use on clean tiles without a primer. You may consider using a primer anyway to ensure excellent adhesion. There are also special products for painting tubs and tiles. These tend to have an epoxy- based formula which creates fumes during the application but results in a highly corrosion-resistant coating. Tub and tile paints create a very hard coat that is moisture and mold-resistant. The best paint for bathrooms should be extremely resistant to moisture and mold. It needs to be easy to clean and pleasing to the eye. Most bathrooms are small to medium-sized, and the best paint colors for small bathrooms are light because smaller rooms benefit from the space created by lighter colors. White is widely considered the best paint color for small bathrooms with no windows, as it makes them brighter and less claustrophobic. The best paint finish for bathrooms is considered to be glossy or semi-glossy, for both aesthetic and practical reasons. Again, most bathrooms are relatively small, and reflective surfaces visually create more space and light. They are also mildew-resistant and much easier to clean, which is important in the bathroom where moisture will inevitably get on the walls. Most paints can be diluted for use with a paint sprayer, but this can be problematic in the bathroom. Spray painting often requires a better-prepared surface. Rolled on paint creates a denser coat that adheres better to the surface, while atomized spray paint forms individual droplets that require a cleaner surface to stick together properly. Paint sprayers also tend to waste much more paint than a manual application with a brush or roller. However, on surfaces such as cabinets, spray painting may be the better option. This will prevent undesired brush strokes on hard-to-reach grooves and corners. After you have decided what paint colors and finishes you want to use and which surfaces you want to paint, it’s time to prep your bathroom for painting. 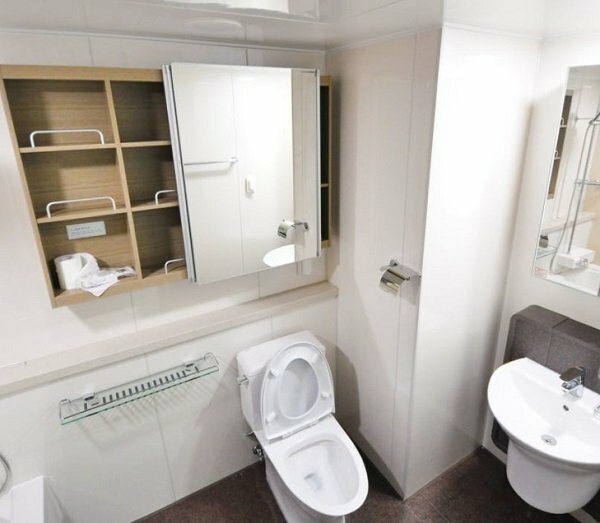 The whole makeover shouldn’t take more than a day or two in regular-sized bathrooms. First, remove all products, accessories, and decorations from the bathroom. These will definitely get paint on them or get in your way, so get them out of there. If you will be painting the wall behind the toilet, it will inevitably get in the way, so it’s better to remove it beforehand. It may seem like a difficult task, but it’s actually pretty simple. All you have to do is disconnect the water supply, flush the toilet to empty the tank completely, and then just remove the tank with a few old towels on the floor. This will make painting much easier and guarantee a more professional look. Sand down any imperfections, cracks, peeling paint, or glossy surfaces. Ensure that the walls are even, clean, and dry before you begin. Apply painter’s tape to baseboard moldings, door and window trims, light switches, and any other edges that might accidentally get painted. Ensure the tape is securely attached and that paint can’t get underneath it. You can use a putty knife to smooth it down. Place drop cloths or protective sheets over the floor and fixtures to avoid dripping paint on them. Ensure that they securely meet the edges and use tape where necessary. If you plan on painting the ceiling, do this first. You should start from the top and work your way down to ensure you don’t drip paint on finished surfaces. If you are using a primer, apply this first. When painting, start by cutting in around fixtures and edges with a paintbrush. Then use a sprayer or roller to cover the larger surfaces. It is best to begin in one corner and then work your way around the room in one direction. If you want to apply a second coat, make sure you let the paint dry for the recommended amount of time between coats. Give the paint as long as possible (up to three days, depending on the paint) to dry before any physical contact to avoid damaging your work. Kilz originated in 1954 as a paint manufacturer. The company produces many products for all kinds of indoor and outdoor purposes and surfaces. These include primers, woodcare products, concrete coatings, and paints. Their products are highly reputed for their versatility, quality, and durability. Many of their paints are self-priming for simple application. Customers consistently rate Kilz primers and paints highly. Founded in 1921, Rust-Oleum has manufactured paints and coatings for residential, commercial, and industrial use for nearly a century. The founder noticed that fish-oil spilled on rusty metal decks stopped corrosion from spreading. Since then, the company’s products have developed to not only stop rust but to offer a variety of excellent protective coatings for many materials. Their brands include Stops Rust, High Performance, NeverWet, Painter’s Touch, Universal, and many others. Founded in 1883, Benjamin Moore is a well-known, reliable paint manufacturer. It has won awards for good housekeeping products, green companies, and customer satisfaction. The company prides itself on their inspiring color collections and the variety of ideas they offer for coloring your home. With Benjamin Moore, you are guaranteed to find not only the best paint color for your bathroom but also any other room in the house and even outside. Now that we’ve covered the basics for choosing the best bathroom paint and the best colors for your bathroom, let’s have a look at the most popular products among DIYers. This epoxy and acrylic-based paint consist of two parts that you must mix together before use. It is an excellent candidate for the best paint for ceramic bathroom tiles and porcelain fixtures. With some thorough prep work, this paint will create an extremely corrosion-resistant coating with a porcelain-like finish. Depending on your particular surface, it is recommended that you sand and clean the area and prime it with a binder beforehand. The product can make any old tub or tiles look as good as new without the cost and mess of complete replacement. You can also use it on fiberglass, acrylic, cast iron, or steel surfaces. It should not be used on galvanized steel, flexible plastic, or areas constantly subject to water like fountains or pools. It is important that you wear a mask and ventilate the space well while you work with this product. The paint comes in three neutral shades including white, almond, and biscuit. This Rust-Oleum product fits the bill for the best paint for bathroom ceilings and walls to prevent mildew and mold. The paint is self-priming and will stick well to the surface with minimal preparation. According to the manufacturer, you don’t even have to worry about sanding. It is water-based, which makes it fast-drying and low-odor. The result is a beautiful washable, scrubbable, stain and moisture-resistant surface for a fresh and clean-looking bathroom. The formula contains a biocide that protects the coating against fungal degradation. It comes in a wide variety of colors including off-white, pastel, and medium shades. It also comes in eggshell, satin, and semi-gloss finishes. Within 24 hours it will be dry to the touch and 7 days will be dry completely. After this, it can be scrubbed. The product can be used on walls, ceilings, trim, doors, and similar paintable surfaces. It is excellent at preventing mold in your bathroom, basement, kitchen, laundry room, and any other interior where mold and mildew are a concern. This Kilz product serves as a primer, stain blocker, and sealer in one. It is specially designed for interior surfaces in high humidity, moisture, and temperature environments. These include kitchens, bathrooms and laundry rooms among others. The primer helps provide a smooth and level finish. You can use it to block light to medium stains, seal porous surfaces, and promote adhesion for your paint. It offers excellent hide for color changes, so you don’t have to worry about getting the best paint color for your bathroom. The high mildewcide content provides a mildew-resistant film that prevents mildew growth between the primer and paint coats. It is made of a water-based, 3-in-1 latex primer is extremely low-odor and can be cleaned up with just soap and water. The primer can be used on almost any properly prepared surface, including drywall, plaster, paneling, stucco, wood, brick, masonry, and painted metal. It dries quickly and can be recoated after just one hour. One gallon covers 300 to 400 square feet of surface. This trim and cabinet enamel adds great value to your furniture. The high-hiding water-based acrylic formula creates a tough coating with a satin finish. It applies smoothly and dries with virtually no brush or roller marks. It is also suitable for spray application with an HVLP spray gun when diluted. The manufacturer recommends applying multiple thin coats for the best results. INSL-X has enamel which is very adhesive, even on polyurethane and varnish. It is also good for re-coating formica and countertops. The paint is guaranteed to give cabinets, shelving, furniture, window trim and other interior surfaces a fresh new look. It is an ideal enamel for bathroom and kitchen cabinets. One gallon of the paint will cover 400 to 500 sq. ft. of a surface. The paint is fast-drying and requires up to six hours of drying before recoating depending on ambient humidity. This interior paint is ideal for use in bedrooms, bathrooms, or kitchens. It comes in a flat finish ideal for ceilings, a softer, eggshell finish ideal for walls, and a semi-gloss finish ideal for trim and doors. It is low-odor and fast drying. Colorhouse creates a durable, washable, and scrubbable surface that is mold and mildew resistant. This is a self-priming product for previously painted surfaces in good condition. One gallon of the paint covers 350 to 400 square feet of surface. It is a Green Wise certified low-odor paint with superior coverage and minimal emissions. This quality paint comes in various, retro and modern artist-crafted colors that make for pleasant backdrops in any room. This Glidden interior paint is from their line of premium latex paints. It is a self-priming paint that is easy to apply. It is suitable for brushing, rolling, or spraying onto any interior walls or trim, as well as furniture. The Glidden forms a durable, wear-resistant coating that prevents the growth of mildew and provides excellent coverage. The semi-gloss finish is ideal for high-traffic areas like the bathroom, kitchen, or kids’ rooms. It is highly chip-resistant and washable so your bathroom will continue to look freshly painted for years to come. The paint is fast-drying and emits minimal odor due to its water-based formula. Cleaning up will only require soap and water. The paint will dry to the touch in under 24 hours. Your bathroom will be ready to use again in 3 days, but you should not scrub the walls for up to 30 days after painting. One quart covers up to 100 square feet of surface. This premium acrylic latex interior paint is self-priming on most properly prepared surfaces. You can use it on drywall, stucco, plaster, or previously painted interior surfaces. Certain materials like metals, new wood, or uncured plaster may require specialized primers. This paint can be applied with a roller and brush. By thinning it for spraying, it will also get the job done very well. It is a fast-drying paint with minimal VOC emissions. It dries to the touch in one hour and can be recoated in four hours. After 14 days, it is ready to be cleaned gently with non-abrasive cleaning products. One gallon of this paint covers 250 to 400 sq. ft. It is available in a huge variety of expertly matched colors and shades as well as finishes ideal for interior and exterior paint jobs. This water-based interior paint by Benjamin Moore comes with unique features. Its Color Lock technology ensures that no color rubs off your surface, stains wash off easily, and the paint is easy to touch-up. The paint forms a mildew-resistant coating ideal for the high-moisture environment of your bathroom. The dense color provides excellent hide and coverage and will do very well in high-traffic areas. The dense color provides excellent hide and coverage and will do very well in high-traffic areas. You can use it on new or previously painted wallboard, plaster, masonry, and wood, as well as primed metal and new or coated ceilings. The paint emits minimal fumes so you can get back to using your bathroom very quickly. This paint is available in thousands of colors as well as matte, eggshell, satin, and semi-gloss finishes. The white shades in the semi-gloss finish are ideal for giving bathrooms a clean, fresh look. One gallon covers 400 to 450 square feet. Like the Rust-Oleum Tub and Tile Refinishing Kit, this Sheffield Porcelain Touch-Up product allows you to refresh the appearance of your porcelain surfaces. You can use it for porcelain surfaces like sinks, tubs, tiles, and appliances. It is ideal for touching up chips, cracks, and nicks for a new look without having to refinish the entire surface. It dries to a hard, chip-proof surface that will not fade or change color. Once dry, the epoxy formula is washable and waterproof and withstands temperatures up to 400 degrees Fahrenheit. It comes in various colors to suit a range of surfaces. It comes in various colors to suit a range of surfaces. The bottle features a convenient brush cap for easy application. This advanced paint and primer in one makes any paint job a simple project. The formula is extremely stain-resistant which creates an extremely durable, scrubbable coat that is easy to clean. It also has antimicrobial properties that will protect your bathroom from mildew and mold. It delivers excellent one-coat coverage in a range of over one thousand colors and finishes. One gallon of the paint covers up to 400 square feet. The manufacturer recommends generously covering small sections at a time while always keeping a wet edge for superior coverage. You can use the paint on any previously-painted surface with the right preparation. Now that you know all about the basics of painting and refinishing your bathroom surfaces, all you need to do is choose your colors, prep your surfaces, and get painting! Remember to always follow the manufacturer’s recommendations for the best results. Hopefully, you can achieve a durable, clean, fresh look for your bathroom. Happy coloring!